Trochocarpa gunnii is a common rainforest understorey plant. 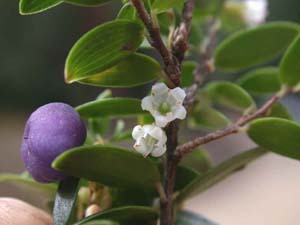 The leaves are alternate, but usually arranged so that the shoot is more or less flattened. It is the only species of the genus in Tasmania with a glabrous corolla. The flowers may be white, pink or red. The foliage of this species is similar to that of T. cunninghamii, however the latter species is almost always a low growing, often scrambling shrub, whereas T. gunnii is usually quite large. T. cunninghamii is more common at high altitudes. It can also be confused with the rainforest Archeria species, but those Archeria species have only one vein visible on the underside of the leaf, whereas Trochocarpa gunnii have about 5-7.